We continue the Find Your Park in our backyard series this month, featuring the Monocacy National Battlefield. Known as “The Battle that Saved Washington” this 1864 battle would be one of the last Confederate excursions into Union territory. Only a short drive from the Inn, the battlefield is just southeast of the city of Frederick, Maryland. As with most Civil War battlefields, a large portion of the Monocacy battlefield remained in private hands for over 100 years. In 1928, George Worthington, owner of a large portion of the fields, had petitioned Congress for the creation of a National Military Park. Although Congress passed a bill in 1934, it would take almost 50 years for funds to be appropriated for the acquisition of land. 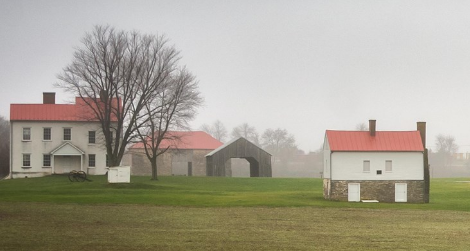 Today the Monocacy Battlefield encompasses over 1,650 acres and is made up of the Baker, Best, Gambrill, Lewis, Thomas, and Worthington farmsteads. These same farms that bore the brunt of the fighting on July 9, 1864 had also experienced the war earlier during both the Maryland Campaign in 1862 and again in 1863 as Union forces were moving north toward Gettysburg. The opening skirmishes of the battle would begin on the Best Farm near Monocacy Junction. Here the Baltimore and Ohio Railroad crossed the Best fields and played a key role in the Union defense. The Battle of Monocacy is often referred to as the “Battle that Saved Washington”. On July 5-6, 1864 about 15,000 Confederate forces under the command of Lt. Gen. Jubal Early crossed over the Potomac River near Sharpsburg and advanced toward Frederick in an attempt to threaten and possibly capture Washington D.C. Major General Lew Wallace, the Union commander in Baltimore, quickly rushed 3,200 troops on the B & O Railroad and headed toward Frederick. Upon reaching the Monocacy Junction, Wallace set up a hasty defense to guard the three bridges and several fords over the Monocacy River hoping to delay Early until Washington could be reinforced. By dawn on July 9, 3,400 Union veterans had reached Wallace from Lt. General Ulysses S Grant. Although still outnumbered more than two to one, Wallace’s force would keep the Confederates at bay during the all day fight. Finally Wallace could no longer hold his position and was forced to fall back and retreat toward Baltimore, leaving behind some 1,300 casualties. The battle cost Jubal Early over 900 men, and he would also lose precious time on his advance to Washington. On July 11, when his army finally reached the outskirts of Washington’s defenses at Fort Stevens, he found that Grant had rushed two more Union divisions from Petersburg, Virginia to bolster the capital defenses. The next day Early withdrew his army back into Virginia, ending the last Confederate invasion of the North. Patrons of the Monocacy Battlefield Visitors Center can enjoy an electric map orientation program, interactive computer programs, interpretive displays, artifacts of the battle and a museum store. There is a self-guided auto tour of the five stops covering about six miles. The park also offers a number of walking trails for visitors to explore the flora and wildlife of the region. While in Fredrick to visit Monocacy, be sure to take advantage of additional points of interest like the National Museum of Civil War Medicine. 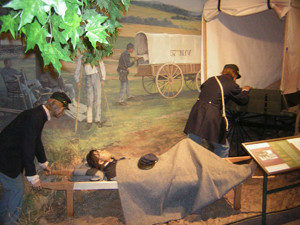 Located in downtown Frederick, the Museum is the premier center for the preservation and research of the legacy of Civil War Medical innovation and humanitarianism. 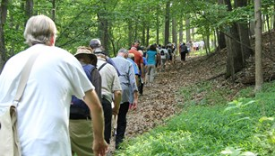 Now get out and Find Your Park – Visit Monocacy!